^ Adams, W. S.; Joy, A. H.; Stromberg, G.; Burwell, C. G. The parallaxes of 1646 stars derived by the spectroscopic method. Astrophysical Journal. 1921, 53: 13. Bibcode:1921ApJ....53...13A. doi:10.1086/142584. ^ Trumpler, R. J. Spectral Types in Open Clusters. Publications of the Astronomical Society of the Pacific. 1925, 37: 307. Bibcode:1925PASP...37..307T. doi:10.1086/123509. ^ Gamow, G. Physical Possibilities of Stellar Evolution. Physical Review. 1939, 55 (8): 718. Bibcode:1939PhRv...55..718G. doi:10.1103/PhysRev.55.718. ^ Sandage, Allan; Katem, Basil; Kristian, Jerome. An Indication of Gaps in the Giant Branch of the Globular Cluster M15. Astrophysical Journal. 1968, 153: L129. Bibcode:1968ApJ...153L.129S. doi:10.1086/180237. 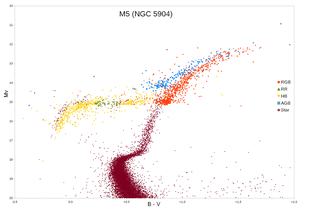 ^ Arp, Halton C.; Baum, William A.; Sandage, Allan R. The color-magnitude diagram of the globular cluster M 92. Astronomical Journal. 1953, 58: 4. Bibcode:1953AJ.....58....4A. doi:10.1086/106800. ^ Strom, S. E.; Strom, K. M.; Rood, R. T.; Iben, I. On the Evolutionary Status of Stars above the Horizontal Branch in Globular Clusters. Astronomy and Astrophysics. 1970, 8: 243. Bibcode:1970A&A.....8..243S. ^ Iben, Icko. Stellar Evolution Within and off the Main Sequence. Annual Review of Astronomy and Astrophysics. 1967, 5: 571. Bibcode:1967ARA&A...5..571I. doi:10.1146/annurev.aa.05.090167.003035. ^ Vassiliadis, E.; Wood, P. R. Evolution of low- and intermediate-mass stars to the end of the asymptotic giant branch with mass loss. Astrophysical Journal. 1993, 413: 641. Bibcode:1993ApJ...413..641V. doi:10.1086/173033. ^ Marigo, P.; Girardi, L.; Bressan, A.; Groenewegen, M. A. T.; Silva, L.; Granato, G. L. Evolution of asymptotic giant branch stars. Astronomy and Astrophysics. 2008, 482 (3): 883. Bibcode:2008A&A...482..883M. arXiv:0711.4922. doi:10.1051/0004-6361:20078467. ^ Rizzi, Luca; Tully, R. Brent; Makarov, Dmitry; Makarova, Lidia; Dolphin, Andrew E.; Sakai, Shoko; Shaya, Edward J. Tip of the Red Giant Branch Distances. II. Zero-Point Calibration. The Astrophysical Journal. 2007, 661 (2): 815. Bibcode:2007ApJ...661..815R. arXiv:astro-ph/0701518. doi:10.1086/516566. ^ Catelan, Márcio; Roig, Fernando; Alcaniz, Jailson; de la Reza, Ramiro; Lopes, Dalton. Structure and Evolution of Low-Mass Stars: An Overview and Some Open Problems. GRADUATE SCHOOL IN ASTRONOMY: XI Special Courses at the National Observatory of Rio de Janeiro (XI CCE). AIP Conference Proceedings. 2007, 930: 39. Bibcode:2007AIPC..930...39C. arXiv:astro-ph/0703724. doi:10.1063/1.2790333. ^ Salaris, Maurizio; Cassisi, Santi. Evolution of Stars and Stellar Populations. Evolution of Stars and Stellar Populations. 2005: 400. Bibcode:2005essp.book.....S.
^ Mermilliod, J. C. Comparative studies of young open clusters. III – Empirical isochronous curves and the zero age main sequence. Astronomy and Astrophysics. 1981, 97: 235. Bibcode:1981A&A....97..235M. ^ Bedin, Luigi R.; Piotto, Giampaolo; Anderson, Jay; Cassisi, Santi; King, Ivan R.; Momany, Yazan; Carraro, Giovanni. Ω Centauri: The Population Puzzle Goes Deeper (PDF). The Astrophysical Journal. 2004, 605 (2): L125. Bibcode:2004ApJ...605L.125B. arXiv:astro-ph/0403112. doi:10.1086/420847. ^ Vandenberg, Don A.; Bergbusch, Peter A.; Dowler, Patrick D. The Victoria-Regina Stellar Models: Evolutionary Tracks and Isochrones for a Wide Range in Mass and Metallicity that Allow for Empirically Constrained Amounts of Convective Core Overshooting. The Astrophysical Journal Supplement Series. 2006, 162 (2): 375. Bibcode:2006ApJS..162..375V. arXiv:astro-ph/0510784. doi:10.1086/498451. ^ Hekker, S.; Gilliland, R. L.; Elsworth, Y.; Chaplin, W. J.; De Ridder, J.; Stello, D.; Kallinger, T.; Ibrahim, K. A.; Klaus, T. C.; Li, J. Characterization of red giant stars in the public Kepler data. Monthly Notices of the Royal Astronomical Society. 2011, 414 (3): 2594. Bibcode:2011MNRAS.414.2594H. arXiv:1103.0141. doi:10.1111/j.1365-2966.2011.18574.x. ^ Stoesz, Jeffrey A.; Herwig, Falk. Oxygen isotopic ratios in first dredge-up red giant stars and nuclear reaction rate uncertainties revisited. Monthly Notices of the Royal Astronomical Society. 2003, 340 (3): 763. Bibcode:2003MNRAS.340..763S. arXiv:astro-ph/0212128. doi:10.1046/j.1365-8711.2003.06332.x. ^ Cassisi, S.; Marín-Franch, A.; Salaris, M.; Aparicio, A.; Monelli, M.; Pietrinferni, A. The magnitude difference between the main sequence turn off and the red giant branch bump in Galactic globular clusters. Astronomy & Astrophysics. 2011, 527: A59. Bibcode:2011A&A...527A..59C. arXiv:1012.0419. doi:10.1051/0004-6361/201016066. Vassiliadis, E.; Wood, P. R. Evolution of low- and intermediate-mass stars to the end of the asymptotic giant branch with mass loss. Astrophysical Journal. 1993, 413: 641. Bibcode:1993ApJ...413..641V. doi:10.1086/173033. Girardi, L.; Bressan, A.; Bertelli, G.; Chiosi, C. Evolutionary tracks and isochrones for low- and intermediate-mass stars: From 0.15 to 7 M☉, and from Z=0.0004 to 0.03. Astronomy and Astrophysics Supplement Series. 2000, 141 (3): 371. Bibcode:2000A&AS..141..371G. arXiv:astro-ph/9910164. doi:10.1051/aas:2000126.